Magnetic resonance imaging (MRI) is being used more often in the evaluation of inflammatory bowel diseases. A prerequisite for adequate image quality is the oral application of contrast medium, which can be administered with different modalities. Positive and negative oral contrast media can be used; in terms of diagnostic efficacy, there appears to be no relevant differences between them. Sequences usually are acquired using breath-hold or respiration-triggered protocols. The underlying principle is visualization of circumscribed thickening of the intestinal wall, which shows a pathologic pattern of contrast medium uptake. 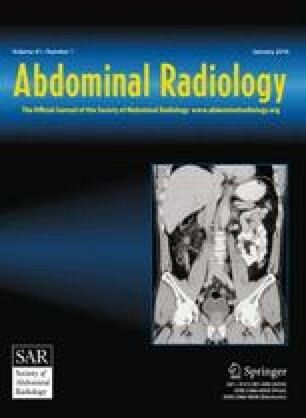 The available data suggest that MRI is equally as effective as enteroclysis in the primary diagnosis of Crohn's disease and actually more sensitive in the detection of extraintestinal manifestations such as fistulae or abscesses. Supporters of the method predict that MRI will replace enteroclysis in the long term. Key words: Magnetic resonance imaging—Abdomen—Crohn′s disease—Small bowel—Oral contrast agents.